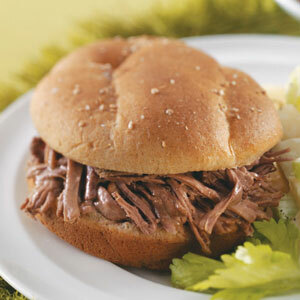 If you like french dip sammies, you'll like this recipe from Taste of Home magazine. Cut roast in half and place in a 4- or 5-qt. slow cooker. Combine the water, bouillon granules and seasonings; pour over the beef. Cover and cook on low for 6-8 hours or until meat is tender. Remove beef; cool slightly. Meanwhile, skim fat from the cooking liquid. Shred meat with two forks; return to the cooking liquid and heat through. Using a slotted spoon, place 1/2 cup on each bun. Serve with additional cooking liquid on the side. 1. Boil water & cook pasta. While pasta is cooking, prepare the "sauce"
2. Saute onion in butter & olive oil for 3 minutes. 3. Add eggplant & mushrooms, salt & pepper. Cook for 3 more minutes. 4. Stir in garlic & flour, cook for 1 minute. 5. Add stock & pesto. 6. Stir in pasta, tomatoes, herbs & cheese.